Tisbury Urban event in the daytime! First time for this use by SARUM of Tisbury which you remember was 13 November in last seasons Wessex Night League. We had 8 members travel up and race hard on sunday, Andrew Beldowski one of the clubs founding members was over from France for the weekend too. Our best positions were Julie Astin 3/14 and James Crickmore 6/19 in their age class standings- smart running!. There were 151 entrants on the sunday which is a sign of times when Urbans on a sunday can take as many entrants as forest events you know that things are changing in Orienteering, relates to points of my blog of previous week. 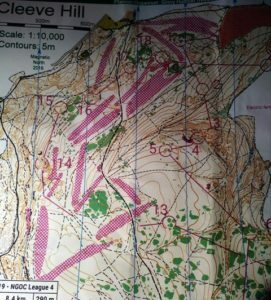 Courses went all over the Tisbury town with some tricky sections of planning keeping the entrants thinking all the way around. Also a big welcome to the Cowan- Deyes family who took part and look to be joining us soon too. The Medlock family went to events in NGOC and SWOC for forest races, heres Jolyons summary and a couple of the maps. “Couldn’t resist a double header of NGOC at Cleeve Hill and SWOC at Cwm Lickey. It was gloriously sunny on Cleeve Hill, above Cheltenham, with fast open orienteering amongst the gorse thickets, between the greens and fairways and in and amongst the old quarries. A super area which will be a different prospect when it is next used for the British Night Champs. Cwm Lickey, above Pontypool, is rough upland moorland in the Welsh valleys, with the lower hillside contoured with spoil heaps and old workings and a very steeply sided cwm to the west with beautiful ancient woodland. 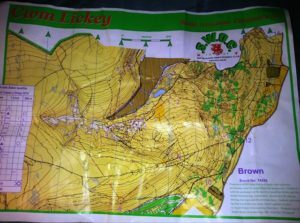 A bitterly east wind kept everyone cool but the physically demanding terrain and ascent warmed us up” A couple of maps to show the terrain and brutal ascent at Cwm Lickey. I was in Dartmoor for the weekend staying in South Zeal, showing Lauren some of the places I used to work in 2005 when doing a season at the Okehampton Adventure centre, this was an important time for me when I started to lead groups and properly work in the outdoors and it was a treat to go there and do some long walks on the North moor. The picture here shows the view into the moor from Anthonys Stile, where the Ten Tors Race starts from which will be known to many of you- the Rowtor, Wes Mill Tor and Yes Tor behind. 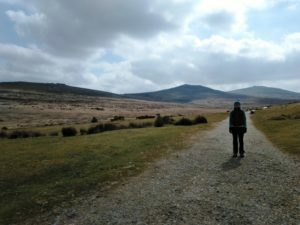 We made an 11 mile loop around on the saturday and then went for Devon cream tea in the Station cafe, remember- its jam first.